Daniela Bertol leads me on a path of white pebbles, which extends down a gentle hill. She walks three feet ahead of me, turning sometimes to speak. Then I can see her dark curious eyes, and Italian nose. In my left hand I clutch a small tape recorder. Down the hill is a small pond, its dock perfectly aligned with our path. This path runs perfectly east-west. On the equinox, the sun rises directly ahead of us. One speaks of the "spiritual path." But right now Bertol and I are literally walking on a spiritual path—a walkway whose purpose is to actualize the soul. I never expected a spiritual path to make such crunching sounds. We walk completely and totally east. How often do I know the actual compass directions around me? This path is like a line of latitude drawn on the globe. I feel as if I'm bowing toward Mecca. Directly ahead, the path passes between two tall hickory trees. The scene—dramatic, serene, almost sentimental—resembles a 19th-century landscape painting, perhaps by Constable. I smell a slightly sweet scent, which I can't place. Is it wild thyme? The sky is a troubled gray. Before I visited, Bertol sent me an e-mail with directions. At the bottom was a quote by Anatole France: "To accomplish great things, we must not only act, but also dream; not only plan, but also believe." But what exactly does Bertol believe? Daniela Bertol was born in Rome, on Via Francesco Sivori, a 15-minute walk from St. Peter's Church. She attended a five-year program at the University of Rome to become an architect. Her thesis was on tensegrity structures, which were developed by Buckminster Fuller. "Buckminster Fuller was another spiritual leader," Bertol told me, laughing. "In a certain way, Buckminster Fuller was similar to the Renaissance, because he had the same holistic approach to life." Tensegrity—short for "tensional integrity"—refers to structures where "push" and "pull" are balanced, such as a geodesic dome. Bertol was an early computer artist, making images of three-dimensional geometrical solids. In 1985, her work was shown at the Cinque per Cinque Gallery in Rome. That same year, in a Roman nightclub, she met David Foell, an American architect studying in Italy. Soon after, she returned to the United States with Foell. 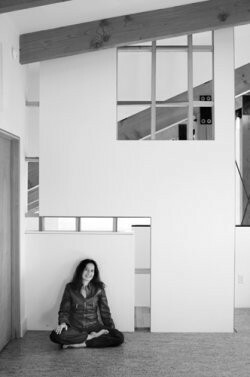 Though she barely spoke English, she went on to write two books: Visualizing with CAD (1994) and Designing Digital Space: An Architect's Guide To Virtual Reality (1996). Bertol and her husband bought a tract of land in Claverack in 1999. The property was so overgrown that the real estate agent didn't want to show it to them. They built the house together, in 2000 to 2001. It is completely aligned on the east-west axis, and is passive solar; i.e. tall windows face south, to take advantage of the warmest hours of sunlight, and dark-colored floors absorb the heat. But the house feels like any elegant Modernist dwelling. It doesn't have the pure yearning of the outer grounds. In 2002, Bertol had a major skiing injury, breaking her femur. She spent six weeks in a wheelchair. After that, she became more involved in yoga, which she had done sporadically for years. She pursued a certification as a yoga instructor at the Integral Yoga Institute in New York City. Now Bertol practices yoga daily. She meditates on yantras and mandalas—geometric figures which balance the mind. She also practices walking meditation. Sun Farm combines several disciplines: art, architecture, horticulture, clock making, meditation, and astronomy. It is part of what Terence McKenna, the psychedelic prophet, called the "archaic revival"—a return to the practices of Druids, Aztecs, and Dravidians. Bertol's modern structures revive ancient sky-worship. She thinks the way the builders of Stonehenge thought. Sun Farm uses just two design elements: lines and spirals. The materials are either local or easily purchasable. Bertol opposes the kind of architecture that flies in rare mahogany from Africa as a statement of status. Past the twin hickories, we turn left, onto another path. Now we are heading due north. At the end of this pathway stands a rectangular structure made of three red pine logs taken from her 60-plus acres. It looks like the Greek letter Pi. "This is the Meditation Gate," Bertol announces. "Meditation is a state when your mind starts focusing into something—could be your breath, could be a mantra. At this point, we start focusing on this place, on the environment." She speaks with a strong Italian accent, and looks less like a visionary than an indulgent mother. We backtrack on the north-south trail, then continue forward 30 feet. Now we are beside Time Helix, a sculpture built of 54 wooden boards, designed by Bertol. "Time is often portrayed as a spiral," Bertol explains. "It's linear, since it goes forward, but at the same time it cycles—at least, astronomical time. Astronomical time is given by the earth revolving around the sun, seasons, days. These are all cycles. If you make a diagram of a circle—the cycle—and a line, which is the arrow of time, you get a spiral. So a spiral is the shape that best expresses time in space." 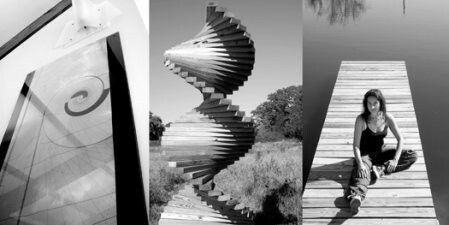 This sculpture resembles a DNA molecule. Bertol explains her inspiration for Sun Farm. In The Sacred and the Profane, anthropologist Mircea Eliade details how traditional cultures in India, Africa, and pre-Columbian America created settlements. They would find a point mythically connected to the center of the earth. There they would erect a stake, and make human or animal sacrifices. The stake was called the "axis mundi." "And to me—aside from the human sacrifices!—it's very interesting," Bertol observes. "You're trying to find your own connection with your center. Connecting with the place, and finding your axis mundi, which is how you start creating your world." In the ancient world, a town would also be a cosmogony—a creation myth. Bertol's own myth of creation is a theory of spirals. In bubble chamber experiments, electrons and positrons follow spiral paths. DNA is a double spiral. Leaves are arranged on plants in a spiral pattern. According to Bertol, 78 percent of galaxies are spiral. Next, we visit the pond. Apparently, it is difficult to excavate a pond in the exact shape of a spiral, because the result looks more like a heart, as if the Universe were speaking to Bertol, in the words of Auden: though truth and love can never really differ, when they seem to, the subaltern should be truth. The pond is deep blue—a dye prevents the growth of algae. Around the perimeter of the pond, Bertol has outlined the intended shape with small wooden stakes—a Platonic spiral. She and I walk back up the white-pebbled path, through the Sunrise Trellis, which also functions as a sundial. By the direction of the shadows, one can read the time. The structure is simply a row of wooden posts eight feet high, joined above by beams. Beneath the Sun Trellis, I feel a marijuana-type elation. A wordless happy humming arises in me. Bertol turns left at her house, towards a squared-off spiral walkway, still under construction. We proceed in silence, following the path of the spiral, from the outside inward. The labyrinth is not large—24 feet square—but walking slowly and deliberately, its inner walkway seems quite long. It's almost like a path made of time, not space. Finally, my feet bring me to the exact center: the womb of Claverack. I close my eyes, hearing a faint wind. Art in New York City is ironic. A successful show comments on the history of art—especially the last three years of that history. The current show at the Whitney Museum by Mark Grojahn, for example, combines op art, process art, conceptual art, and obsessional art (all very voguish right now). Upstate, however, art is sincere. A painter sits before a waterfall with her oils because she loves that waterfall. The resulting painting is bought by someone who loves waterfalls. Bertol designs conceptual "land art," but it is sincere. In fact, it is more than sincere. When I was 21 years old, I lived in Gainesville, Florida. There I came to know J.J. Aaron, a gentleman who lived on 5th Street NE. When he was 81 years old, the Spirit appeared to him one night and commanded him: "Go carve!" He created images of animals and people in cypress wood, using a chainsaw, hammers, and chisels. Somehow, he formed vivid eyes for them—apparently out of resin. Though he died in 1979, Aaron is moderately famous today as an "outsider artist." Daniela Bertol reminds me of J.J. Aaron. She is an architect who was visited by the Divine. She too was commanded to create art. Bertol Googled me, and discovered that I ran for President of the United States in 1996. "Actually, I ran in the last three elections, also," I volunteered. "Will you campaign in the next election?" she wondered. "I'm not sure," I admitted. "You should run!" We all have our dreams. Some build a spiral labyrinth in Columbia County. Some seek the Presidency. To the outside world, our dreams seem arbitrary, absurd. To ourselves, as we sketch our next project on a page in a journal, lying in bed in the afternoon sunlight, our dream resembles a beautiful face. Daniela Bertol will be teaching hatha yoga classes at Sun Farm, Saturdays at 3pm and Sundays at 10am, beginning December 2. A group meditation will be held on the winter solstice, Sunday, December 17, at 3pm. For more information visit www.sky-spirals.org. Drawing of Astronomical Sky Spiral on the wall of Daniela Bertol's houseâ€”according to Bertol, a spiral is the best shape to express time in space. Time Helix, a wood sculpture designed by Bertol, made of 54 timber segments in 108 rotations. Bertol sitting on the jetty of her Spiral Pond. 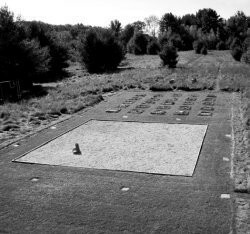 Landscape design including a Zen-inspired 24-foot square gravel garden at Sun Farm in Claverack.